Last Saturday it was announced that Tyson Fury will fight Martin Rogan at the Odyssey arena in Belfast, Northern Ireland. The fight will take place on April the 14th which is also the same night Audley Harrison makes his comeback against Ali Adams. Most fight fans are disappointed in this match up, mainly because Tyson Fury could have been fighting David Price instead of Martin Rogan but to put a long story short Fury vacated his belt in order to pursue a world title fight. Even though I side with the fans that would much rather see Fury fight Price, Fury Vs Rogan should be a barn burner for however long it lasts. One thing you can take from this matchup is that it will be a good exciting fight. A lot of pride is at stake, Rogan is a proud Irishman and Fury is very proud of his Irish roots. Both probably regard themselves as the best and most popular Irish heavyweight. So for both, they will believe they can’t walk the streets of Ireland if they lose to their Irish rival. There’s also good reason why both need to win the fight. Rogan has already lost twice in Ireland in front of his fans. He will do everything in his power not to get embarrassed in front of his home crowd again. Fury needs to win and look good to convince his sceptics that he has what it takes to progress onto world level, because in his last outing he looked anything but world class. So both have a lot to prove, Rogan has to prove he has still got what it takes to pull off an upset, and Tyson needs to prove he can fight without getting put down onto the canvas or badly hurt in the ring. My prediction for this fight is a Fury stoppage. Fury really should be blasting the likes of Martin Rogan out of the ring, but like he has shown in the past he is easy to hit and is capable of being hurt. It really wouldn’t surprise me if this fight follows the same transcript as Fury’s fights with Nicolai Firtha and Nevan Pajkic. This would basically see Fury having one or two hairy moments in the fight due to a bad defense or lack of concentration and as a result being hit and hurt. Then after realising he has to switch on and get the job done, he stops his opponent with a relatively early stoppage. That’s likely to happen. But I think Fury now gets the message that he has to give all of his opponents respect in the ring and come into each and every fight in good shape. If i’m right and Fury has booked his ideas up then we will see him get the job done without any heart in mouth moments for Mick Hennessy. And the Tyson Fury road to a world title will resume again. 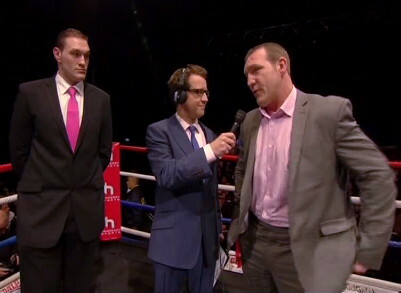 If Tyson Fury and David Price win their next fights then the boxing world will demand for a Fury/Price match up. But I really don’t think that fight will happen unless a world title is at stake. I think Hennessy will get Tyson a European title fight. Alexander Dimitrenko and Kubrat Pulev are fighting for the EBU heavyweight title on March the 31st so I can see Tyson fighting the winner of that bout. Another option is of course Richard Towers. There was talk of Fury and Towers fighting for a version of the European title sometime this year but that hasn’t happened yet. However I can see it happening in the near future. I wouldn’t mind seeing that fight happen because it would be a ‘someone’s 0 has to go’ type fight, and they always make for exciting contests. A final option is Ruslan Chagaev. Some people will be surprised at this suggestion but Chagaev is definitely on the slide so Hennessy may make this fight for a ‘good name on the resume’ for Tyson. To sum up, I agree with boxing fans when they say this is a terrible match up compared to Tyson Fury Vs David Price, but as I mentioned earlier in the article it could happen in the future, with a bigger title at stake and when both are more household names than they at present. Plus Fury/Rogan is an entertaining fight. I would like to see Fury step it up after this fight (presuming he gets the win) and fight someone who is a bit more dangerous. What do you think of this match up and what who would you like to see Tyson Fury fight next? Thanks for reading.